The unemployment rate and labor force data on this page comes from the Local Area Unemployment Statistics (LAUS) program which is a Federal-State cooperative effort in which monthly and annual estimates of total labor force, employment and unemployment are prepared. These estimates are key indicators of local economic conditions. 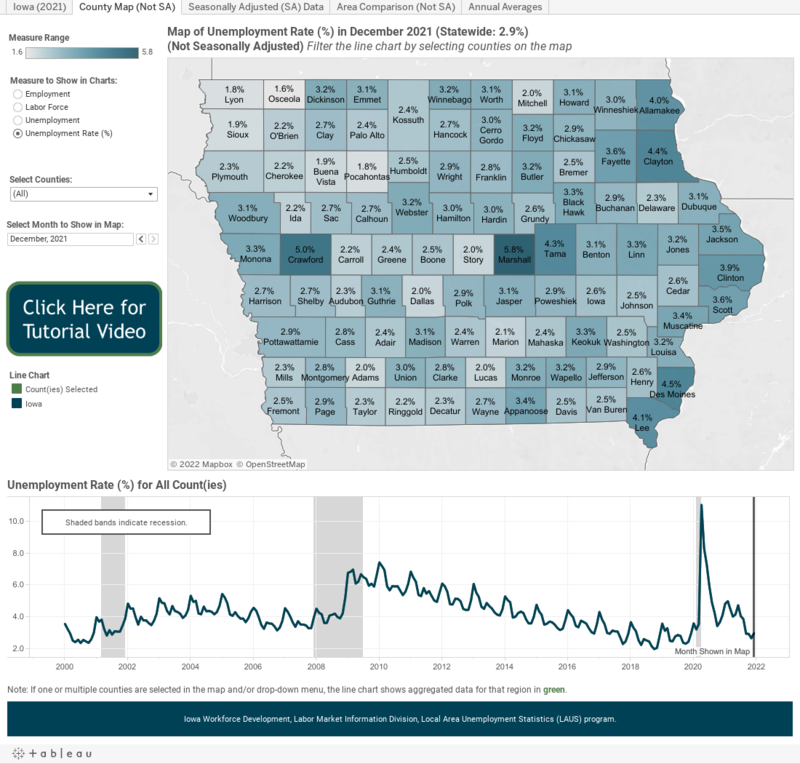 The Labor Market Information (LMI) Division at Iowa Workforce Development (IWD) provides these estimates for the State of Iowa, its counties, metropolitan statistical areas (MSA) and various regions across the State. If you have questions regarding the Local Area Unemployment Statistics program click the button below to be taken to a list of frequently asked questions or send an email using the contact information at the bottom of this page. Current data can be viewed and explored in the Tableau visualization below. Navigate the various visualizations by using the three tabs at the top of the frame. To customize the view select the measure, geography and timeframe from the filters at the left of the map. As these are adjusted the map and chart will update accordingly. Custom regions can be created by selecting the desired counties in the map while holding down the Control/Command key. The data is also available in a CSV file. Click the button below to download the file.